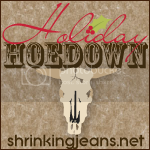 Week four of the Holiday Hoedown over at the Shrinking Jeans, and I’m happy to say that I’m still loving the challenge. This week presented me with a little more stress. I’m (still) getting used to the new Weight Watchers plan, but loving it. I just tend to do bad things when I’m stressed – drink more soda, eat more sweets, whatever. Not this week, though (well, except for one evening. I’m not perfect, after all.) I was pretty aware of all negative things around me, and tried not to “fix” it with food. –This week, I was able to get in 244 minutes of exercise. That’s a lot more than last week! And I did get in several days of 40 minutes of exercise. I’m trying different things between the Wii and my workout DVDs. No going outside, though. It’s way too cold. –Fruits and vegetables were again easy for me. I’m getting in more fruits now with the new WW plan. –Water was challenging over the weekend, but I got it in. –As for new activities, I’ve been checking out more strength and yoga exercises on the Wii Fit. Stuff I’ve never done before. I’m actually liking the yoga….think I should check out one of our DVDs soon. –Last night, I attacked the peanut blossoms I’ve been baking. Needless to say, rather than going down, my weight stayed the same this week. (I’m lucky it didn’t skyrocket.) The cookies have now been boxed up and delivered to other people. Any remaining cookies will be going to neighbors this evening. too bad bari and i aren’t your neighbors – they sound yummy!! Awesome week for you! That’s a great amount of exercise. For yoga, you might enjoy the Rodney Yee DVDs. (Some libraries have them, and I’m pretty sure Netflix has them.) I like his AM/PM one, because it only takes 20 minutes to do.